Chris Moore took down the 2008 Wynn Classic on Wednesday evening, overcoming a stacked field of 183 players to take down the first place prize of $692k. 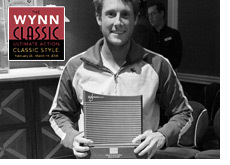 The second place finisher was Ryan Young who earned $355k for his efforts. Young was the chipleader throughout much of this tournament and entered heads-up play as the chipleader (2.1 million vs 1.47 million). However, Chris Moore made quick work of Young in heads-up play. The pivotal hand saw both players got their chips in the middle on a flop of J 8 5 with two spades. Moore held J-5 of diamonds for top and bottom pair, while Young held the A-J of hearts for top pair/top kicker. The turn and river brought the nine and four of diamonds, giving Moore and unnecessary flush and the dominant chip lead. The tournament was soon over as Moore pushed all-in holding pocket kings, and Young called holding the A-5 of hearts. The flop brought the King of clubs, and the turn/river brought no miracle straight for Young as Moore won the tournament with a set of Kings. Moore took third place in this same tournament last year. This was a stacked tournament that included many big names. Most of the big names were knocked out before the final table, as Mike "The Mouth" Matusow and Alfredo "Toto" Leonidas both narrowly missed out on being a part of the final day of play. A number of other big names, such as Erick Lindgren, Michael Mizrachi and Eli Elezra were knocked out earlier in the tournament. All in all, this was a well-received tournament that will likely keep growing in size.